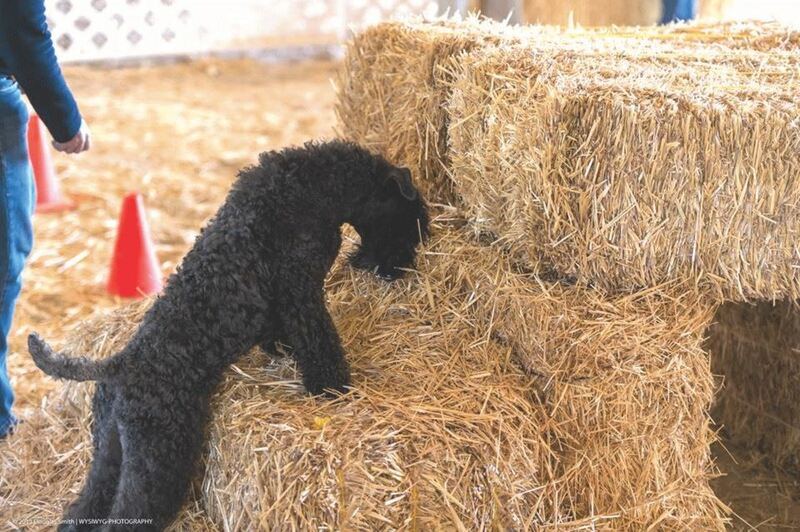 United States Kerry Blue Terrier Club, Inc. - Interested in Barn Hunt? Interested in trying Barn Hunt events? This weekend, June 1st & 2nd, (2013) the Dachshund Fanciers of SW Washington held four barnhunt trials with RATI (instinct) and RATN (novice) classes with dogs divided into three sizes – Large, Medium and Small. The RATN title requires the dog to correctly identify and signal which of three hidden PVC tubes contains a live rat; one of the other two tubes contains used rat bedding, and the third tube is empty. The dog must also run through a tunnel made of hay bales, and jump up on one of the bales. Two minutes are allowed for each run, and the dog is timed. The handler must be able to “read” the dog’s body language to determine if it has found a live rat and verbally notify the judge. (I called out “rat.”) Of course some dogs found a tube with only bedding in it, or an empty tube, and if the handler called out “rat” when there wasn’t one in the tube the dog failed the test. If the dog did not run through the tunnel, jump up on a bale, or ran out of time it also NQ’d. An advanced RATO (open) class was added Sunday afternoon for those dogs who earned an RATN title in the three previous trials. Barb & Derek Ward and I came with four Kerries between us – Barb’s Beau and Sloane, and my Rowan and Terra. I believe we have the first Kerries to pass the RATI instinct test and earn RATN titles. RATI is a preliminary test, but three legs are required to earn RATN and RATO titles. All four of our Kerries passed the instinct test; Beau, Sloane and Terra earned RATN titles, and Terra moved up to RATO, as she completed her title Sunday morning. Alas, Rowan believed that all of the tubes contained rats; he qualified in his first trial as the first tube he found did contain a rat, but in the subsequent three trials he didn’t qualify, as he alerted on a non-rat containing tube. In addition, Sloane won her Large RATN class Sunday afternoon, and High in Trial with the lowest time to complete the course; she also placed second in one of her other classes. Beau placed third in one of her Medium Dog RATN classes. Terra won third in her Large Dog RATN class Sat. morning and finished her title with three straight wins. She also placed second in her Large Dog RATO class, and earned her first leg towards the RATO title. It was a lot of fun working with our dogs. One of the most important things I learned was to watch the dog’s body language as it went around the course, and the signals used when it found a rat tube as opposed to a tube with no rat in it. We could talk to our dogs and encourage them to jump on a bale and go through the tunnel, praising them when they succeeded, but could not touch or guide them. Our Kerries showed that they have not lost their basic instincts to locate their prey. This is a fun and challenging sport where dog and handler must work as a team. The AKC recognizes BH titles, and I hope that there will be more trials all over the US. Editor’s Note: This same weekend on the east coast Sara Garthly and Youlia Anderson also participated in Barn Hunt events with their Kerries. Reports on their experiences will be added in the future.